Fries made from turnips? Yup! If you’ve never tried a turnip, now is the time. These flavorful turnip fries are the perfect way to get more vegetables on your table. Anyone else out there think that one of the best ways to eat vegetables is by making them into fries? I know I’m not alone in this! 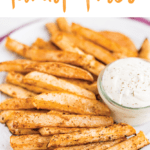 If you’re a parent, fries might be your secret weapon to getting your kids to eat more veggies. So far I’ve created sweet potato fries, squash fries, jicama fries… and now turnip fries. I have very few turnip recipes here, but I love root veggies and I’m really excited to share this recipe for a couple reasons: 1) Fries are one of my favorite foods and 2) turnips are so healthy! Before I hop into the recipe, let’s chat about turnips for a quick second. What are turnips and what do they taste like? Are turnips good for you? Turnips are loaded with fiber and a variety of vitamins including vitamin K, A, C, E, B1, B3, B5, B6, B2 and folate, as well as minerals like manganese, potassium, magnesium, iron, calcium and copper. They’re also a good source of phosphorus and omega-3 fatty acids. When compared to white potatoes, turnips are significantly lower in calories and carbs. I wasn’t kidding about the fries. 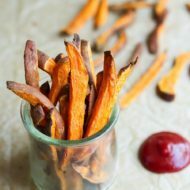 As long as they aren’t deep fried in a ton of gross oil, fries are a great way to get new veggies into your kiddos diet! I have mastered a crispy, tasty baked fry. It takes some patience because they take awhile to get crispy but #worththewait! Shredded vegetables hidden in baked goods are my second tip. Yes, a sweeter treat with vegetables counts too! I love adding shredded zucchini or carrot to oatmeals and baked goods – they make the dish super moist. Sorry if you hate that word but it really is the best describing word for this scenario! 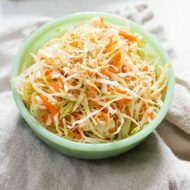 Fair warning: sometimes you can see the shredded vegetables in the dish so if your kids are a super sleuths you might have some pushback on this. Try this zucchini bread oatmeal or these carrot cake breakfast cookies! Feel like you have some new tips up your sleeve to get some more vegetables on the table? Know that any vegetable is a win, don’t feel like you need to have your kids eating beets (although they are delicious…). 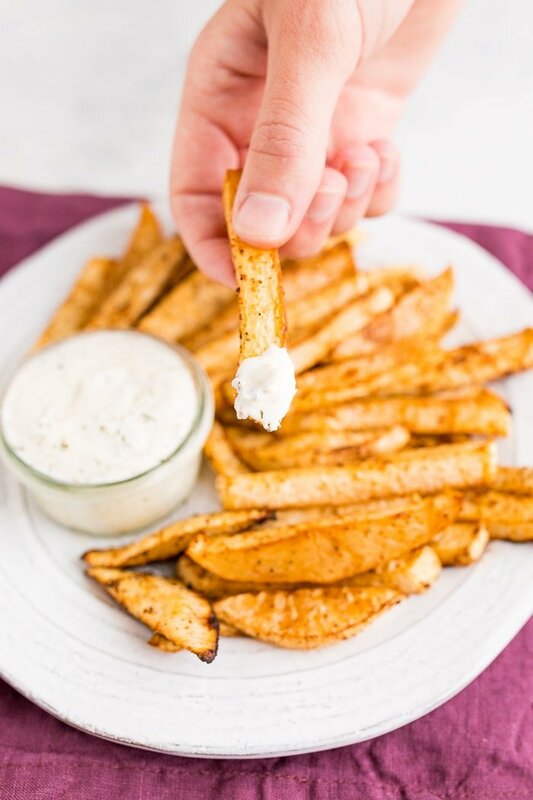 I’m pretty plain when it comes to fries and normally just stick with ketchup for dipping, but I wanted to create something fun for this recipe so I whipped up an east 3-ingredient ranch Greek yogurt dip. The dip is absolutely delicious, but not 100% necessary to enjoy these turnip fries so feel free to serve them with your favorite dipping sauce. Fries made from turnips? Yup! If you’ve never tried a turnip, now is the time. These flavorful baked turnip fries are the perfect way to get more vegetables on your table. Preheat oven to 425°F. Add turnips to a large bowl and toss with avocado oil, salt, garlic powder, pepper and chili powder. Pour turnips on to a baking sheet (lined with parchment if you’d like). Roast for 15 minutes. Toss and continue roasting for another 10-15 minutes. While the turnips are baking, make the greek yogurt dip by adding Greek yogurt, ranch powder and apple cider vinegar in a small bowl. 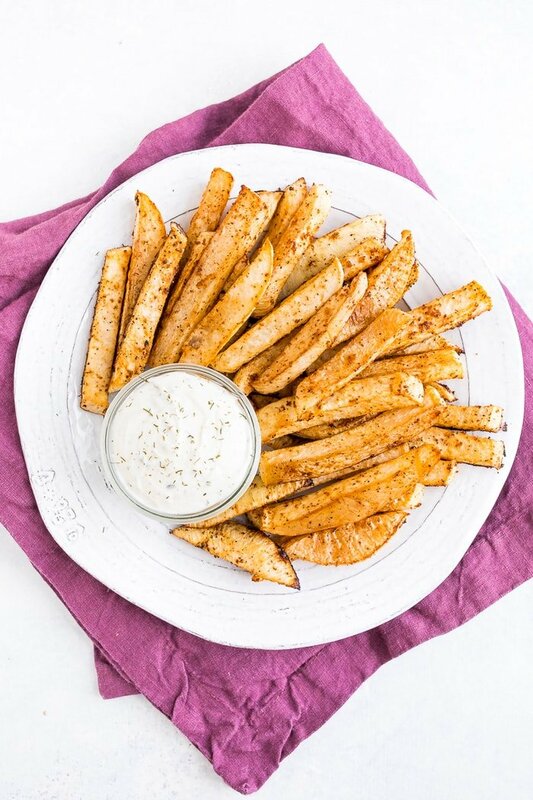 Serve turnip fries with Greek yogurt dip and enjoy! 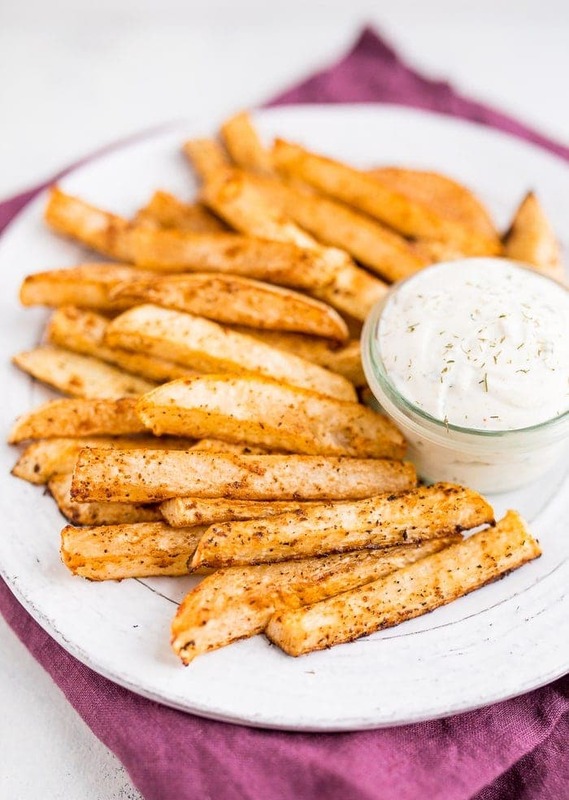 If you make these baked turnip fries with the Greek yogurt dip be sure to let me know how they turn out by leaving a comment and star rating below. 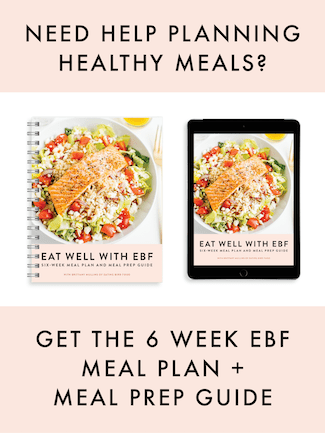 Your feedback is so helpful for the EBF team and readers. yum yum yum — i definitely want to try this recipe! Turnips are truly one of my favorite root veggies, right next to parsnips and this idea is definitely a great one! 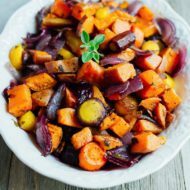 I love roasting root vegetables, it brings out the natural sweetness and is so versatile! 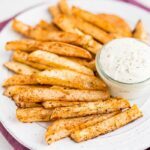 I can’t say I’ve ever tried turnip fries before but these look so good! I think I have everything else this recipe requires–I just need to go get some turnips!